Does Contact Wolf have a limit on the number of records I can add to the database? No limit! Contact Wolf is powered by a relational database that grows as needed so its capacity is unlimited. Does the software print labels ? Yes! Contact Wolf supports most Avery labels and other label types too. Just insert your label sheet into your printer, select the records to be printed and your labels are finished. The PRO version also includes a custom label designer. What is the difference between Contact Wolf and Contact Wolf PRO ? 1) Image Linking - Link any image (jpg,gif,bmp,etc) to a record. The image is displayed in the main window when the record is selected. 2) Contact History - Add a dated contact history to any record that allows you to save a detailed list of all contact events ( meetings, phone conversations, discussion notes, etc) for any record. 3) Document Linking - Link multiple types of documents (pdf, Word, html, xml, txt, Images, Excel (csv), etc) to your contact records. This allows you to save and link images, databases, email messages, letters etc. to your records for easy reference. 4) Bulk Emailing Engine - Powerful built-in Email Engine capable of bulk emailing thousands of messages. 5) Custom Label Designer - Lets you select what to print on the label and how you want it to look. Can I organize contact records into groups so that I can only view a particular group of records ? Yes easily ! Contact Wolf allows you to create your own categories or Groups as needed so that you can assign and categorize your contacts as desired. You could for example create categories for friends, employees, customers, clients etc. Then you can quickly display only the records from a particular category so you can create email lists, phone lists, reports, etc. Can I email multiple recipients using Contact Wolf ? Yes. Contact Wolf allows you to select multiple records and send email to all with one click of your mouse....or create email lists for export. What are the Contact Wolf Reports used for ? Contact Wolf includes multiple reports that allow you to view and print records with the data already organized and formatted. The Report viewer also allows you to export data in many formats including (pdf, Excel, CSV, Lotus, Rich Text, Word docs, XML and more). Can I set alarm reminders to remind me of meetings or to make phone calls, etc ? Yes. Contact Wolf allows you to set an unlimited number of alarm reminders for any record in your database. Can I import my contact data from other software ? Yes. It supports importing data in Comma Separated Format (.csv) also known as "comma delimited format". Most programs (Excel, Outlook, etc.,and most address software) can export data in this format so that it can be imported into Contact Wolf. Can I use it on a network and share the data? Yes. Contact Wolf is easily configured for almost any network. We provide Step-by-Step instructions so anyone can do it! No. All upgrades are completely FREE! The software even includes an option that checks for new versions and downloads upgrades for you when one is available. CLICK BELOW to try out the BEST Phone Book Software on the net. 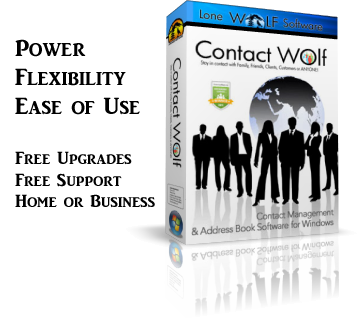 See why Contact Wolf has become the most popular Phone Address Book software on the net !